Sorry for the delay in this post. I had every intention of getting it posted on Friday, but sometimes as a mom life gets in the way. Daredevil went snowboarding last weekend and cut his face open and ended up with 6 stitches. Not fun. But we finally got the stitches out on Friday and had to go to lunch to celebrate. Then of course, a million other things happened, so it just didn't get done. But before I went on to the next party, I wanted to show you the yummy Soccer Team party Dessert table that we had this weekend. Watching over our Soccer field is the Bleacher Cupcake stand that I shared with you how to make. The cupcakes are yellow cake with chocolate and white frosting. Then I wrapped the white frosted cupcakes in our Soccer Ball Cupcake Wrappers. Above the bleachers, I used our Soccer Field Pennant Banners to spell out "Good Game". It took me the whole party to realize why the pennants looked just a little off. Finally I realized that I had forgotten to add a center field line to the background design. So I did fix that, but not in time for the party. To the right of our Bleachers is the Cookie Bouquet nestled in Hershey drops. I placed the bouquet on a plastic toy megaphone that I found at Dollar Tree for only a $0.25! On the left side of the cupcake stand is another Cookie Bouquet. This one is nestled in Hershey Kisses with our Soccer Ball Kiss stickers on the candies. Once the cookies are all claimed, the candy inside the bouquet can be eaten with ease. On the right side of the soccer field, I made brownies with cream cheese frosting push pops. I was trying for the black and white theme and don't know if I totally achieved the look I was going for, but I was told they were SUPER yummy and my kids at least LOVED the cream cheese with the brownie flavor. I had a HARD time finding a way to display the push pops on the table since I didn't want to go with Styrofoam or such, so I ended up using a printer laser cartridge box and wrapping it in a black tablecloth from dollar tree. I couldn't find any black wrapping paper, so this worked best. Then, I cut holes in the top large enough for the stick to go through, but not the base of the pop. It worked great! Twelve of the pops sat perfectly and they were easy to get in and out of the box. On another printer box wrapped in black, I placed our popular Soccer Ball chocolate covered oreos. 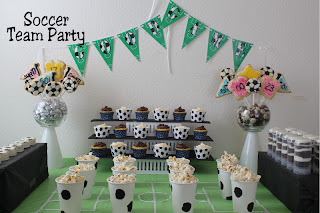 Lastly, I placed white cups that I stamped with black dots onto the soccer field area. I then filled them with popcorn. This was an easy task that looked super cute when it was done. Its also a great way for your kids to help. When the kids were ready to leave, they recieved these fun Soccer Ball Candy Boxes with M&Ms inside to take home. The tags say"Thank you for kicking around with me today!" In the end, we had a fun party and the kids enjoyed the fun crafts and sweet treats. All thee details are absolutely amazing. I love it.